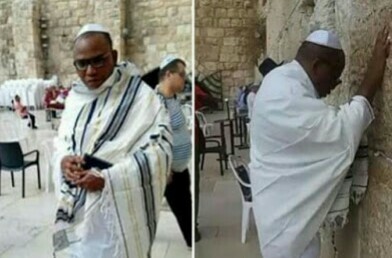 Biafra (IPOB), Nnamdi Kanu, may have to stay longer in Israel where he is currently holed up, following his failure to use the travel document that would have enabled him to move to the United Kingdom. It was learnt that the Biafran agitator failed to utilise the Emergency Travel Document provided for him by the British authorities until the document expired. The UK High Commission disclosed this in Abuja on Saturday in response to inquiries by one of our correspondents about its role in Kanu’s escape to Jerusalem. The UK High Commission Senior Communications Officer, Tinu Adelegan, explained this in an email responding to The Punch enquiries on the IPOB leader. It could not be ascertained why Kanu, a British citizen, needed an ETD to travel to the UK. According to the official UK government website, www.gov.uk, a citizen could apply for an emergency travel document (sometimes called an ‘emergency passport’) if he was abroad and needed to travel and can’t get a passport in time. The website further explained that a Briton could also apply for an emergency travel document if he was outside the UK, had his passport lost, stolen, damaged or full or expired or is with Her Majesty Passport Office or a foreign embassy. A citizen could also obtain an ETD if he doesn’t have time to renew or replace his passport before he travels. Kanu had disappeared from the country in controversial circumstances in 2017, following the invasion of his home by troops. There had been speculations about his whereabouts and safety for over a year before he resurfaced at the Wailing Wall in Jerusalem last Saturday.